Brooklyn will get slightly more insufferable next week when the borough’s minor league baseball team, the Brooklyn Cyclones, hosts a celebration of ’90s Nickelodeon. The ’90s Are All That night takes place Aug. 27 and is, of course, sponsored in part by the kids’ network. 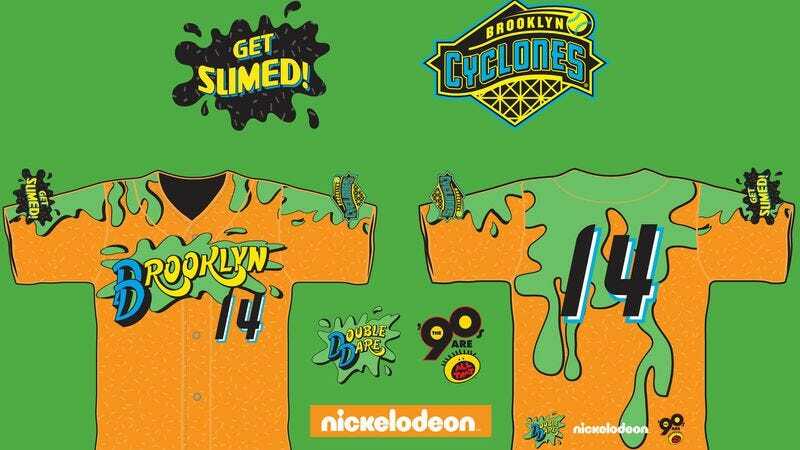 Cyclones players will sport commemorative “slimed” jerseys, while 100 fans can fork over $25 for both tickets to the game and access to a pre-game “taping” of Double Dare Live, complete with random sliming. Some signature Nickelodeon icons will be on hand, like mascot-sized versions of Angelica, Chuckie, and Tommy from Rugrats, and the real-life Kel Mitchell from All That, who’ll throw out the game’s first pitch. All 150 of the stadium’s concession workers will wear Good Burger hats, and fans can stop to get their picture taken in a photo booth stocked with props like the Aggro-Crag from Guts. Other highlights include games of Pogs on the stadium concourse, a Mario Kart pushcart field race, and a Pokémon “Gotta Catch ‘Em All” contest of some sort.